Commercial and industrial noise and vibration surveying measure the level of noise on a commercial or industrial development. If you’re planning a development, most proposed or existing units will require commercial noise surveys as part of the planning stage. This is particularly the case with units close to residential areas. 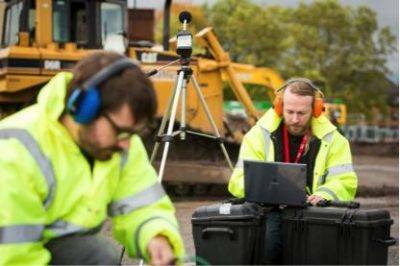 Commercial noise surveys will usually be requested by your local planning authority or the environmental health officer. Furthermore, you will need to conduct a commercial noise and vibration survey to comply with the National Planning Policy Framework, British Standards and Control of Noise at Work regulations. These regulations are intended to limit the noise disruption to existing residents. Furthermore, they also protect people from excessive noise in the workplace. Fully trained engineers with extensive experience in the field. Specifically tailored commercial and industrial noise and vibration surveys to suit your project, budget and requirements of the local authority. Accurate, thorough testing methods. These include mounting noise dosimeters on personnel who carry out noise intensive tasks and manual octave band analysis. Finally, we’ll produce a noise assessment report which is robust, concise and proves that you meet the requirements set. With UKBC’s noise surveying service, you can be confident you are fully compliant with The Building Regulations. To carry out a noise and vibration survey, you should provide us with complete site plans, a secure location for our monitoring equipment and access to the site. UKBC are experts in acoustic consultancy and noise surveying. We offer a full range of noise surveying services, including commercial and entertainment noise surveys.